There is no arguing with the fact that email marketing is one of the most powerful return-generating tools in any marketer’s arsenal right now. Email provides a direct link from your business to your target customers, whenever and however you see fit. When used properly, the ROI from email marketing can be enormous, but when done incorrectly, a campaign can do more harm than good to your brand’s reputation. By focusing on creating a smarter email marketing campaign, you can make the changes needed to maximize your return while reducing the percentage of underperforming addresses on your mailing list. 1. Make Sure You’re Tracking Everything One of the most common mistakes that email marketers make is that they aren’t using their result-tracking capabilities to the full extent. In marketing, the more data you have on your consumers and their habits, the better. Tracking everything from who opens your messages to which links and images convert the best allows you to not only improve your future mailings, but also segment your list to better target your messages to your potential customers’ preferences. Email marketing, as marketing.org discusses, is the tried and true best method of reaching your target audience to draw new customers in and keep existing customers coming back. The digital age has birthed all sorts of online marketing, but the direct contact with a customer that an email newsletter provides cannot be matched by any other form of online communication. And while mass email marketing is still popular and commonly used, more marketers are turning to a more personalized approach known as behavioral targeting. Behavioral targeting allows you to tailor content based on customers’ preferences, browsing, and shopping habits. With this method, your direct mail marketing takes the user’s website activities or past purchases and uses those statistics to personalize the delivered content. Email marketing can be one of the most effective ways to stay in touch with your customers and prospects, but it must be done in the proper way. So many businesses now use email marketing that it has become very competitive, and customers’ inboxes are becoming filled with messages that come from a variety of different companies. Because of this fact, you must be creative in your approach to ensure that your emails get opened and read. If you think that you can get by with just sending normal emails to your customers, you will be disappointed to find the all of your hard work and effort is going to spam and trash folders. Thus, here are 5 tips that will not only keep your emails in the inbox, but that will also ensure that they are fully read by your customers. If your emails are nothing but pitches with links to sales pages, people will quickly tire of reading them. Yes, people like to receive notification of deals and sales that are taking place, but they more than likely will care very little about these things if they don’t want to buy your product. This makes it so that when they actually need something that you can offer, they will be much less likely to look at your emails once again and try to find a deal. If you want to make sure that your emails never become repetitive, you need to offer content that can be useful for everyone, even for those that have no interest in buying your product at the time. For example, if you have a landscaping business, you don’t want to be sending emails every week that highlight the special deals and services that you can offer. Instead, send an email once a week that gives people some advice on how they can care for different aspects of their property. Try to correspond these pieces of advice with the season of the year, and make sure that it is quality of information that they probably do not know. You can then include a special deal or an advertisement for your services at the bottom of the email or on the side, but the actual information should be the main content of every piece of mail. This will ensure that your emails are read, and that your information is easily accessible when people actually need your services. Whether your business is stuck in a rut or you are looking to build on the momentum you already have, you might be thinking about more ways to start boosting your business. Maybe you have considered hiring new employees, investing in a fancy new storefront, or running a new promotion to lure in new customers. While none of these ideas are bad, they are all costly to any business, especially a small one. But there are ways for your business to give itself a boost without making huge expenditures. One tool that every business should be utilizing in today's age of digital communications is email marketing. But while plenty of businesses are emailing their customers, not every one of those businesses is taking full advantage of the opportunity this direct form of customer communication offers. Below are five must dos for every business that wants to use email marketing. Last year I was sent a copy of Eric Groves' (Senior VP of Global Market Development at Constant Contact) book, The Constant Contact Guide to Email Marketing. I've just now gotten around to reading it, and I'm glad I did. I'm a marketing professional. I want people to pay me to do their marketing. But in reality, I understand not everyone can afford to hire me or someone else. I'm still a nice person, so I like to help people do their own marketing. Tomorrow I am giving a presentation on email marketing , so I thought I’d share my notes with you here. Also, I just got a link to this blog post: 100+ Tools & Tutorials to Optimize Your Email Marketing Campaigns. It’s an amazingly in-depth list of tools and resources that will help you improve your email campaigns. Emails sent to your contacts should be informative and useful, not blatant, advertisements. Readers appreciate resources that help them, and they keep that in mind when they need your services or products. So I keep hearing email is dead. That spam killed it. And while, despite trying to run by opening new email accounts, spam keeps finding me and hunting me down while it breeds like bacteria, I don’t believe that email is dead. I just read an article in Revenue Magazine called “Old Dog, New Tricks,” about how email is in fact alive and kicking. 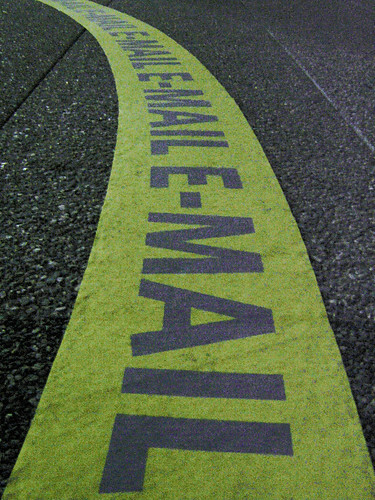 It says that Web 2.0 is breathing new life into email campaigns. The article says that according to Datran Media’s December 2006 annual email study, 83.2% of those surveyed chose email marketing as their primary marketing strategy for 2007. That says a lot. It says that business people are getting sales out of email campaigns, so how could email be dead? Email has definitely evolved in the 10 years it’s been around. Now the focus is on user generated content (UGC). Rather than pummeling subscribers with sales messages, more businesses are offering content from customers, which creates a better tie between company and subscriber. Businesses are also using email to promote their blogs, RSS feeds and videos. The less like advertising it looks, the better received it is. And if readers enjoy the emails, they’ll always come back and become customers. I think email is a great tool, if used right. I put out a newsletter for Egg Marketing once a month that has some of my better articles from this blog as well as news about what’s going on with the company. If I or the company has been involved in something noteworthy (i.e. my becoming an SOB on Liz Strauss’ blog!) I’ll put that in there too. I’ll include a coupon at the bottom for my services, but overall the newsletter isn’t blatantly screaming “buy from me!” I am actually considering putting out more emails, because it seems the consensus has changed about how frequently to send out messages. I don’t like spam. I’m sure like me, your spam folder is filled with emails that promise to fulfill your every sexual need. Unfortunately, I’m not the target market for Viagra and its counterparts. While the idea of spam is that by blanketing every findable email address with an ad for a given product, a percentage will buy it, this isn’t an effective marketing ploy. Don’t do it. Spammers are careless marketers. But, if even 1% of 100,000 buy their product, that’s enough to pay for the time spent spamming! According to Techdirt, 14% of people read spam, and at least 4% admit to buying products from spam emails. Still, it’s an unsavory practice, and you can hope that spammers don’t sleep well at night. So how do you make sure only those people who are within your target receive your marketing message? In this case, we’ll focus on email marketing. Here’s a true or false quiz to see if you know the answer.